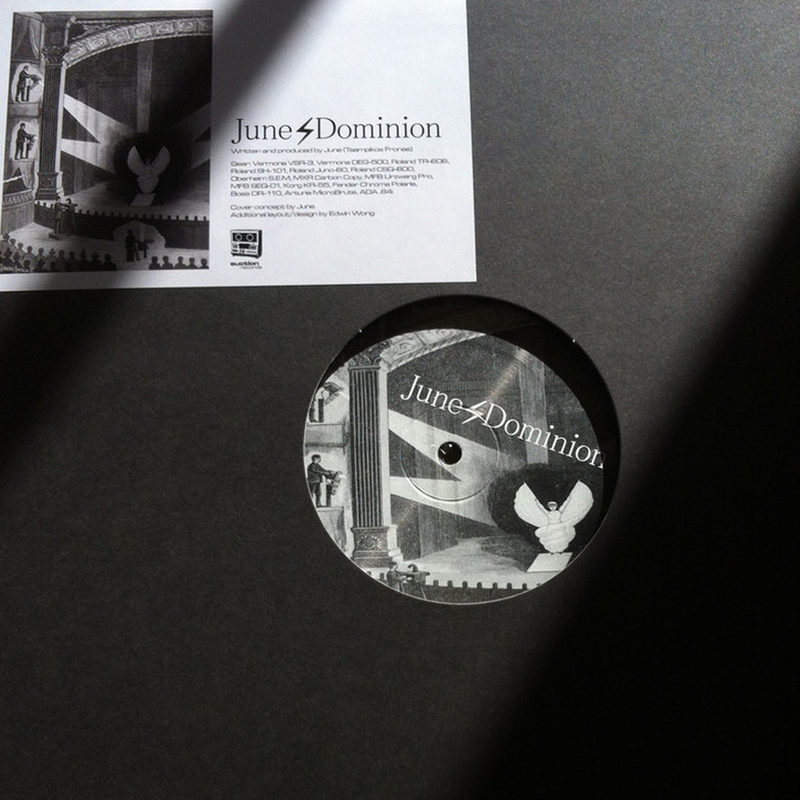 After a string of 12" EPs for his own June Records label, Suction Records is pleased to present "Dominion", the debut full-length LP by June﻿. June is the solo project of Tsampikos Fronas, originally from Greece and now based in Berlin, Germany. He caught the attention of Suction Records with the 2013 EP "Golden Era," a sublime selection of intricate instrumental synthesizer music made with classic analog machines, which at times is reminiscent of artists such as Legowelt, Solvent and Perspects. June has also been making waves with another side to his hardware analog sound, with much of his output falling firmly into the classic Chicago acid realm. 2014 saw June turning many new heads with "The Human Target," an EP divided evenly between June's synthwave and acid tracks, catching the attention of prominent DJs such as Helena Hauff, Intergalactic Gary and Traxx. "Dominion" is focused on June's synthwave sound, utilizing hardware step sequencers to sync and control his arsenal of classic drum machines and synthesizers, which include Roland's SH-101, TR-606 and Juno-60, as well as the minimal synth percussion staple: the Korg KR-55. The romanticism and elegance of early '80s synth pop is clearly evident, not only in the production and instrumentation of the music but in the artwork and song titles as well. Even more prominent is the influence of modern minimal synth master Sean McBride of Martial Canterel and Xeno & Oaklander, who's sophisticated and classicist sequencer compositions loom largely over the material on "Dominion" (minus McBride's distinctive vocals). Save for the gorgeous and meditative "Queen Of Flowers" cuts that end both sides of the LP, the music on "Dominion" is driving, danceable synthwave that references the past while maintaining a thoroughly modern edge.